The Freedom Principle: Experiments in Art and Music, 1965 to Now links the vibrant legacy of the 1960s African American avant-garde to current art and culture. 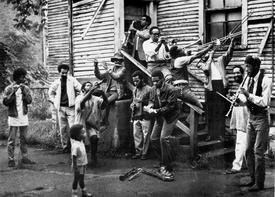 It is occasioned in part by the fiftieth anniversary of the founding of the Association for the Advancement of Creative Musicians (AACM), a still-flourishing organization of Chicago musicians whose interdisciplinary explorations expanded the boundaries of jazz. Alongside visual arts collectives such as the African Commune of Bad Relevant Artists (AfriCOBRA), the AACM was part of a deep engagement with black cultural nationalism both in Chicago and around the world during and after the civil rights era. Combining historical materials with contemporary responses, The Freedom Principle illuminates the continued relevance of that engagement today. The exhibition, which takes its title from a 1984 book by Chicago jazz critic John Litweiler, showcases the multifaceted world of the black avant-garde in Chicago during the 1960s alongside a selection of contemporary artists’ interpretations of this heritage. It includes works of music and art from, among others, AACM-founder, pianist, and painter Muhal Richard Abrams; Art Ensemble of Chicago bandleader Roscoe Mitchell; and AfriCOBRA cofounders Jeff Donaldson, Jae and Wadsworth Jarrell, Barbara Jones-Hogu, and Gerald Williams. Archival materials—brochures, banners, photographs, posters, sheet music, record covers—provide a rich context for the exhibition. 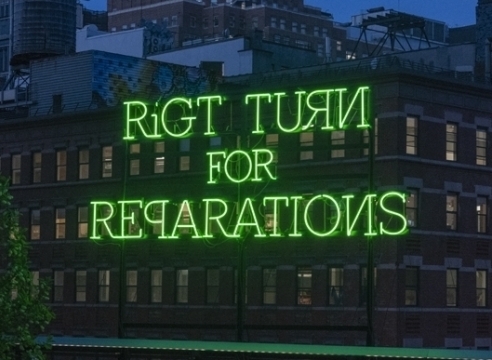 Recent works by artists such as Terry Adkins, Nick Cave, Renée Green, Rashid Johnson, Lili Reynaud-Dewar, Cauleen Smith, and Stan Douglas present an ongoing intergenerational conversation about experimentation, improvisation, collective action, and the search for freedom. Working together across multiple platforms, Catherine Sullivan, George Lewis, Charles Gaines, and Sean Griffin are collaborating on an opera, to be presented on the MCA Stage, and on a related installation within the exhibition. A listening station and an online microsite accompany the exhibition, as does a fully illustrated catalogue that includes essays by exhibition curators Naomi Beckwith and Dieter Roelstraete, as well as by leading musicians, composers, artists, and scholars. The Freedom Principle is organized by Naomi Beckwith, Marilyn and Larry Fields Curator, and Dieter Roelstraete, Manilow Senior Curator, at the Museum of Contemporary Art Chicago. It travels to the Institute of Contemporary Art at the University of Pennsylvania, September 14–December 31, 2016.